When I got back into painting almost a year ago, I went right back to my old favorites. I used to buy Utrect paints almost exclusively. Utrecht is known for being high quality and affordable, being well above “student grade“ quality but not outrageously expensive. There used to be a Utrecht store in Portland, down in the Pearl District, near where there used to be art galleries, but are now only expensive clothing stores and restaurants. In 2013 Blick Art Materials bought Utrecht. The Utrecht store is gone, but a Blick store appeared in the same neighborhood to replace it. When I restocked for painting I bought two “kits” of Utrecht paint - a “basics” set of common painter’s hues, and a “portrait” set with some subtle browns and pinks. I supplemented these with some acrylic mediums and a few other tubes of this and that. A month or two ago the cap on my tube of “Brilliant Blue” (Pthalo Blue plus Titanium White) snapped right off. The twisty bit separated from the screwy bit. A little while after that my new tube of Burnt Umber did the same thing. Once is a happenstance, twice is a coincidence. Can we make it all the way to conspiracy? I am worried that the quality of Utrecht art supplies has diminished. I never had a tube break on my. Sure, I split the sides of a tube after crimping it up to get the very last bit of paint out. But to have a cap just twist apart? Never. The colors seem a little less rich now too. This could be my faulty memory, but I find I have to take care not to end up with a chalky looking painting. Too much binder? Too much filler? I would like to believe that the quality diminished when Blick bought the brand, but it’s likely that I’m just remembering wrong. Maybe what seemed like decent paint when I was in school really wasn’t. I do not want to drop a pile of money to buy all new paint, but I have decided to slowly replace my Utrecht paints with Golden acrylics. I’m already using Golden acrylic mediums. 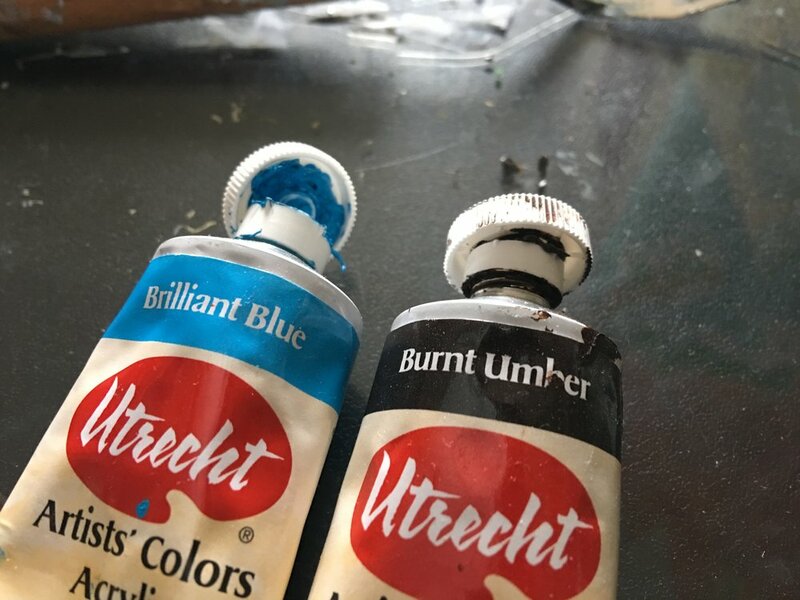 This weekend I picked up some Cobalt Blue and Burnt Umber to replace the broken tubes. Soon I will need a tube of white. I'll replace that with Golden too. It makes me a little sad to walk away from a brand that I trusted. I have fond memories of receiving a big box full of canvas, gesso, and paint ordered from the Utrect catalog. It was art-school-Christmas. Golden always seemed overpriced and glitzly. Golden sales reps would come by our school to show off all the fun things you could do with a $30 tub of heavy body acrylic paint. We would laugh behind their backs. But now I have a job with a paycheck and I cannot abide low quality.